Cory Bennion has received 29 cycling tickets, most for riding without a helmet. And 17 of those were written by Seattle police Officer Glen Mulkey, who issues 124 per year and has amassed an incredible career total. Riding a bike in Seattle hasn’t been quite the same since Glen Mulkey started as a motorcycle patrol officer. After transferring from a Seattle Police Department SWAT team to a traffic detail downtown in 2006, Mulkey began his, uh, complicated relationship with the city’s cycling community. In just four days on the job — this was in July 2006 — he ticketed 37 riders. That’s more bike citations than most traffic cops write in a whole year. He was just getting warmed up. 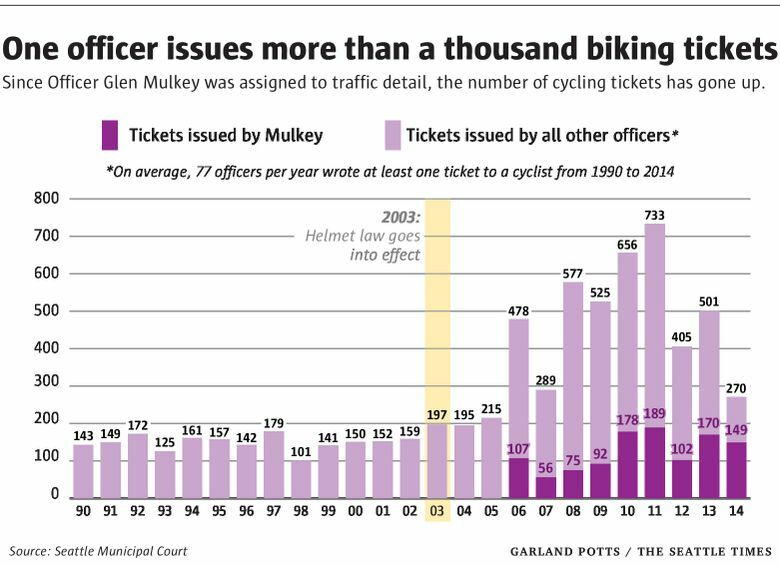 Analysis of Seattle Municipal Court records show that from 2006 through 2014, Mulkey tallied 1,118 cycling tickets — an average of about 124 per year. He wrote one-quarter of Seattle’s total bike citations in that period — a far greater number than any other single officer, and more than the next two most prolific ticketers combined. The number of helmet violations Glen Mulkey has given. The number of moving violations Glen Mulkey has given. The number of helmet violations Cory Bennion has received. The number of moving violations Cory Bennion has received. 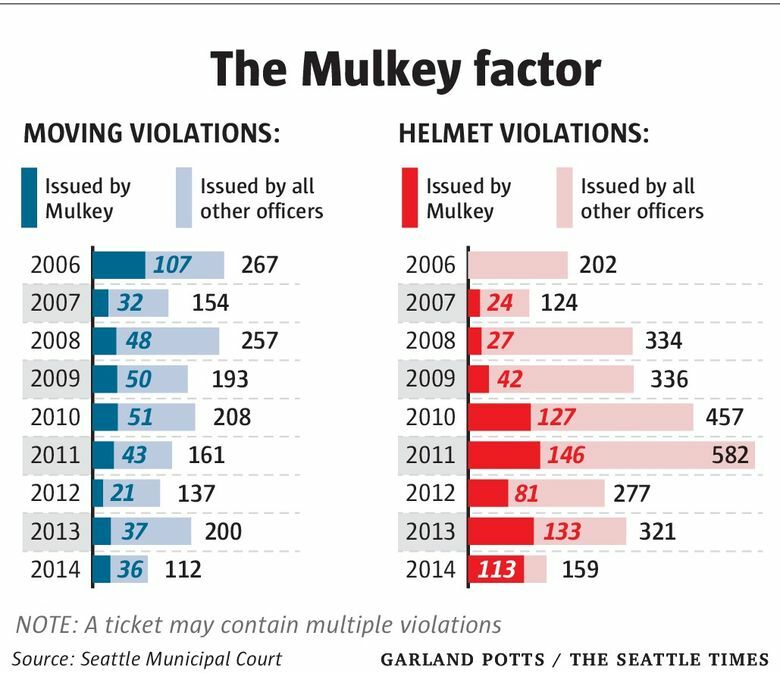 Last year, Mulkey wrote a little more than half of all cycling-infraction tickets issued in Seattle. Most of those were for noncompliance with the county’s helmet law. • When riding on a road, cyclists must follow the same laws as vehicle drivers. • Cyclists may use a path, sidewalk, bike lane, shoulder or travel lane as needed for safety. • Cyclists must yield to pedestrians on sidewalks and crosswalks; vehicles must yield to pedestrians and cyclists. • No bicycle may move into the path of a vehicle that is too close for the driver to stop. • Cycling at night: Bicycles must use a white headlight that is visible for 500 feet. A red reflector must be on the back, and a red taillight may be used along with the reflector. I wondered if he might have been assigned to what the SPD calls an “emphasis patrol,” with a focus on cyclists. But when I called to ask him, he declined to comment. So according to SPD, this was not just a personal initiative of Mulkey’s. Someone who might argue otherwise is Cory Bennion, a longtime Seattle bike courier who also owns a business making messenger bags. 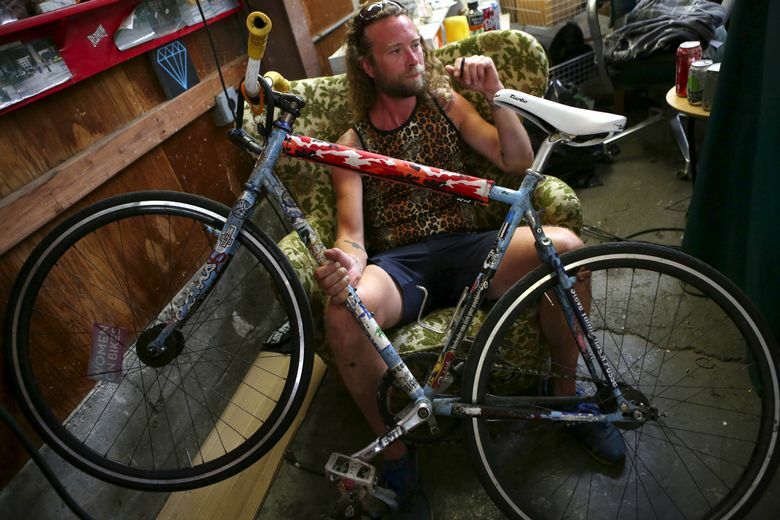 Apparently, Mulkey is well-known among Seattle’s cadre of bike messengers who work downtown. “We’re all quick to let each other know — we send a text message: Hey, Mulkey’s out,” Bennion says. “We all know his hang-out spots. The reason I contacted Bennion is that he’s received 29 cycling tickets, the most given to any individual in Seattle history (at least since 1990, which is how far the court records go back). One of Bennion’s tickets included two violations for a total of 30. Nearly all of Bennion’s tickets — 25 of them — were citations for riding without a helmet, a $102 fine. And 17 of those helmet tickets were written by Mulkey. He admits it’s a valid question, and he wouldn’t advise anyone else not to wear a helmet, even though he personally doesn’t. The most obvious reason Bennion doesn’t wear a helmet — and nearly every cyclist will find this relatable — is that he doesn’t like them. But he also points out that he is hyper-aware of his surroundings when he rides, and — simply put — he knows what he’s doing. Those two qualities, he feels, are far more important to safety than merely wearing a helmet. And they have kept him basically injury-free in 15 years of working as a messenger downtown. And it’s also a matter of principle. “It should be a choice,” Bennion says — and in fact, when he began messengering in 2000, it was. King County’s helmet law was not extended to Seattle until 2003. When that happened, Seattle became one of just a handful of big cities in the world where adults are legally mandated to wear a helmet when cycling. You can pedal helmetless through New York, London, San Francisco, even Rome, with its crazy traffic — but not Seattle. “I grew up in Utah, where there’s no motorcycle-helmet law. I watched guys going down the interstate 80 miles per hour in just a pair of jeans,” Bennion says. Even after Seattle’s helmet law went into effect in 2003, it wasn’t strongly enforced right away. Only nine helmet tickets were issued in that first year, and Bennion didn’t get the first of his 25 helmet tickets until 2008. 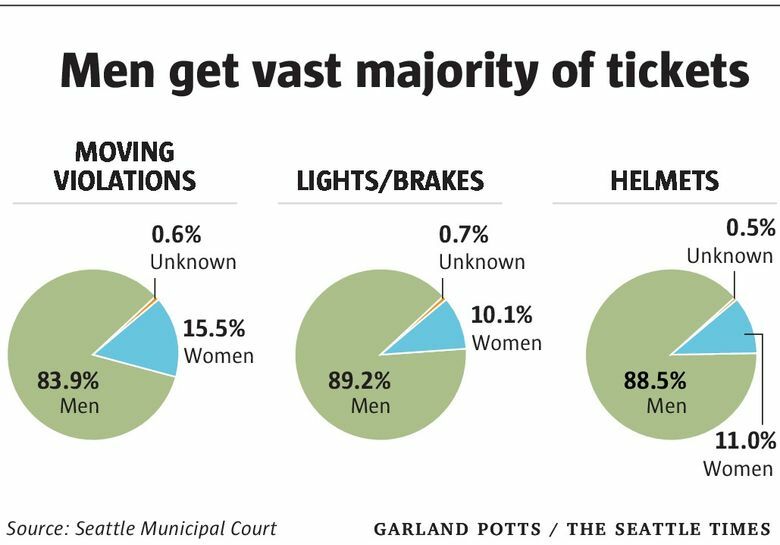 The data also reveal that bike ticketing skews overwhelmingly toward men, regardless of the type of violation. Overall, since 1990, 86 percent of bike tickets have been issued to male cyclists.